A suspected drunken driver crashed into a pulled-over patrol car in Bremerton on Thursday night, sending first responders diving for safety, according to the Bremerton Police Department. Police had been called out on a report of a possibly intoxicated driver on 11th Street around 8:30 p.m. Upon stopping the driver, an elderly woman, the officer determined that she was experiencing a medical issue and called for aid, according to a news statement released Friday. The officer activated his emergency lights, positioned his patrol car diagonally behind the woman’s car in order to shield it from oncoming traffic, and got out of the car to direct traffic, police said. When Bremerton Fire & Rescue and Olympic Ambulance arrived, medics got a gurney so they could move the woman to an aid vehicle parked on Roosevelt Avenue. As medics brought the gurney toward the woman’s car, the police officer saw a Honda speeding downhill on 11th Street toward the parked vehicles, and he called out to his fellow first responders, police said. The Honda crashed into the patrol car, moving it 15 feet and pinning the gurney between the patrol car and the woman’s car, police said. 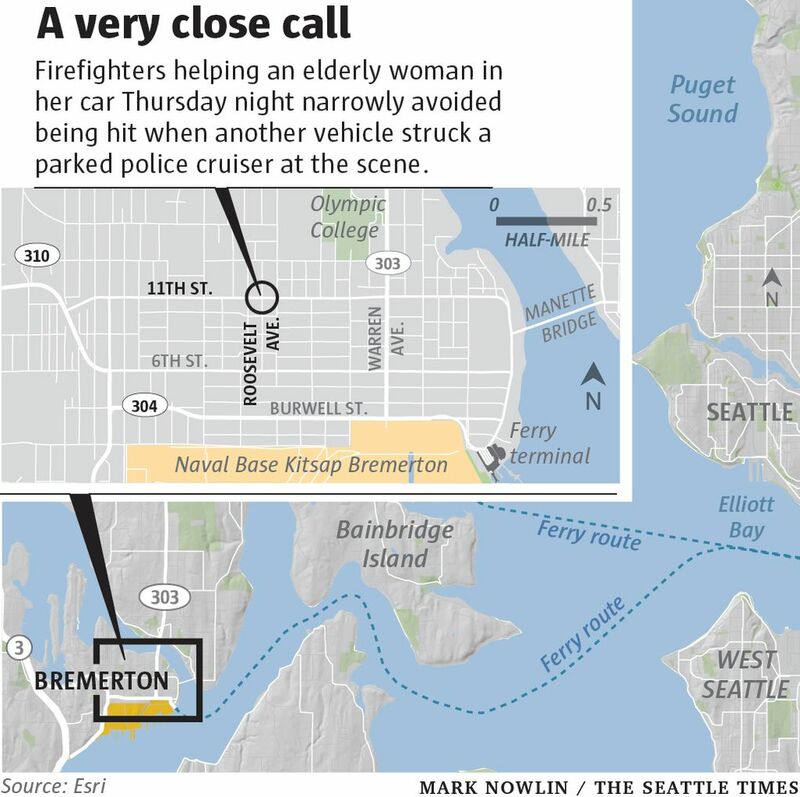 Two Bremerton firefighters narrowly avoided being hit by “diving out of the way,” and an attendant from the ambulance company was hit by the gurney and almost pinned between the gurney and the woman’s car, police said. The 25-year-old driver of the Honda, who is employed by the U.S. Navy and stationed at the Bangor submarine base, was escorted from the car and seated safely off the roadway, police said. The Washington State Patrol found the Honda driver’s blood alcohol content was nearly three times the legal limit, police said. Police said no one was seriously injured, although one ambulance attendant was taken to a hospital for evaluation. The elderly woman from the initial call was treated at the scene and released, according to police.